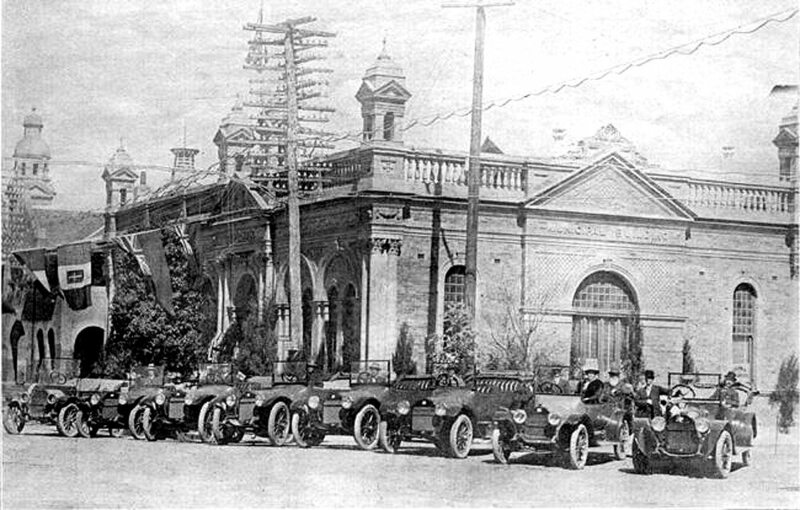 The accompanying photograph tends to show the increasing popularity of Buicks in the progressive town of Inverell, N.S.W. This photograph was taken on September 7th, during the, visit of his Excellency the Governor of N.S.W., and, immediately after his reception at the Town Hall. The Town Hall it will be noticed was decorated for the occasion. 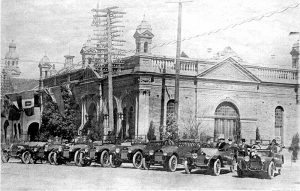 No less than 4 six-cylinder Buicks took active part in conveyance of Vice-Regal party and guard of honor through the town and these cars appear in the photograph together with several others that were available. Mr. C. Martin, manager for B. & W. Ltd., is the agent in Inverell, and although he has been our agent for only 18 months, he has succeeded in placing 16 cars. This result, not only proves the capabilities of the agent but speaks volumes for the car itself and evidenced by its present popularity, we predict a good “Buick” future for the Inverell district. (Agent is in the 3rd car from left).